Our initial model is to create a cell structure for each school. A school needs at least one eReader device, they may have more devices if the usage warrants and justifies more. Each device is configured with a shared Amazon account (which can be used to share content on up to 5 devices in parallel, according to Amazon’s web site). So a single purchase can be downloaded onto up to 5 devices and therefore any teacher can use any available device. These names can be used to find their respective wish list. However, at the moment, Amazon.co.uk does not allow us to purchase items on behalf of the schools from other Amazon accounts. Therefore, at the moment someone with access to their Amazon account needs to login using the respective account details to pay for items from the wish list; the schools do not have Internet access so it’s impractical for them to do so. Alternatively gift certificates can be used to credit the account and enable the school to purchase items autonomously. Once others can directly pay for items from a school’s wish list we can transition towards a more federated, independent system with no centralised authority or arbiter of purchases, etc. Services such as Amazon’s whispercast https://whispercast.amazon.com make content distribution easier using a hub and spoke distribution model (where content can be distributed to one or more groups of accounts). This service currently limited to the US amazon market. On Valentine’s Day we launched the pilot program with 3 pairs of schools. Each pair consists of a primary school (8 years of schooling from 5 years old) and a secondary school (which covers 4 years of schooling). The Kenyan schooling is known as 8+4+4 with the final 4 years intended for university or college. 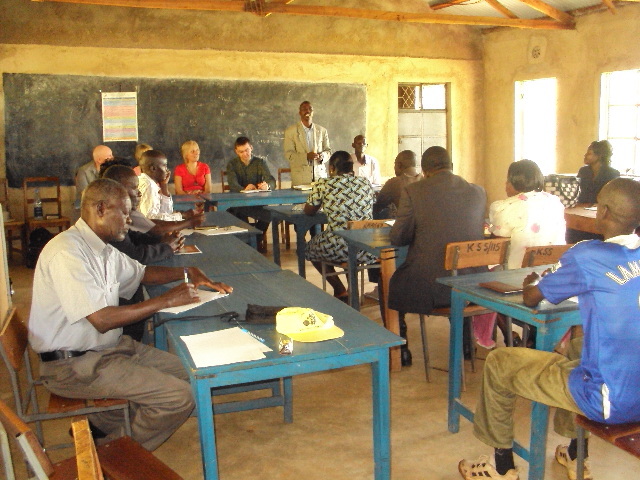 We held a workshop with teachers from the 6 schools, and with various school governors, the local chief, a representative from the district education, and various senior pastors, together with several people from the UK and several local staff of the charities we support. I (Julian) ended up taking charge of the teachers during their tutorial / experimentation which was fun and surprisingly effective.The teachers has 2 sessions where they experimented with the devices to learn how they could be used. At the end of each session various teachers shared some of their discoveries with the teachers from the other schools. This helped them to realise they have more to gain from being open and collaborating, than if they kept their discoveries private. The teachers each signed for the devices as part of establishing the formal pilot project and so they realise they’re now responsible for them. The don’t have to repay anything if the equipment is lost or damaged though. That wouldn’t be useful or productive… They each have a copy of a guide on how to maintain their device and keep it safe. They seemed very excited to use the eReaders. 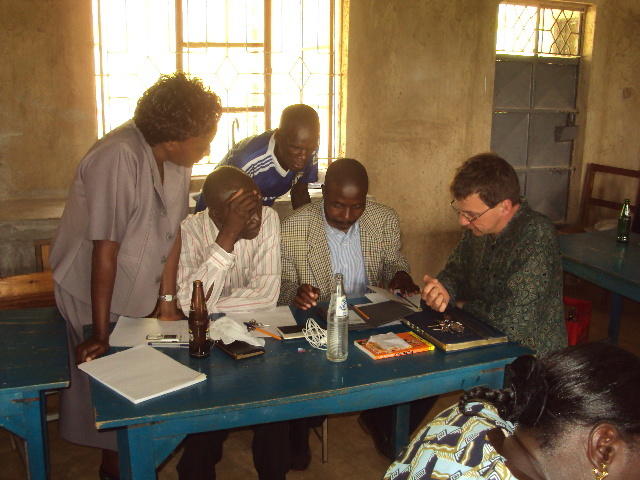 In Kenya there are 2 people helping with the ongoing support: Leonard who liaises with the teachers and is helping encourage and support them to use the devices productively, and Jeremiah who deals with the technical aspects e.g. establishing Wi-Fi connectivity and helping with charging the devices where the school has no suitable power. We left Jeremiah with the spare Kindle. What did we start with Kindle devices from Amazon? Wish-lists are available so teachers can request material where it can be paid for later on, even by other people abroad. We will cover the topic of wishlists and payments in more detail in another blog post. 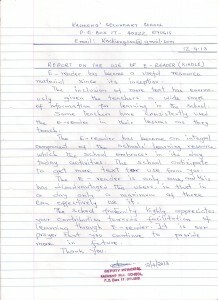 We also wanted to start the pilot as soon as practical and to learn during the pilot. We needed to keep the number of variables relatively small, and we did not want to spend months evaluating a vast set of potentially competing technologies. We don’t know what will work yet, and furthermore there may be alternative options that are more effective than our first choice. So we have consciously adopted an approach where we pick and try several things in parallel. This includes technologies, connectivity, content, schools, content distribution, etc. We expect to expand the number of parallel paths during our experiments and pilot projects. However, we also select and support combinations which seem suitable. Devices: we started with 2 devices: The Kindle Keyboard (3rd edition) 3G+Wi-Fi is the main device – we started the pilot with 5 of these. The current Kindle 4 with the 4 way controller, Wi-Fi, (and no touch screen) – we started the pilot with 2 of these. Cases: For the Kindle Keyboards we use the Amazon case that includes a built-in LED light; and for the Kindle 4 we use the Solar-Mio integrated case with solar panel built-in LED light and in-built battery. Although these are expensive, our initial impressions are very positive. Charging: Our devices need power, and to be recharged. We are evaluating solar panels, with and without internal batteries, as well as the standard mains USB chargers. We will cover the solar and other power options in another blog post soon. 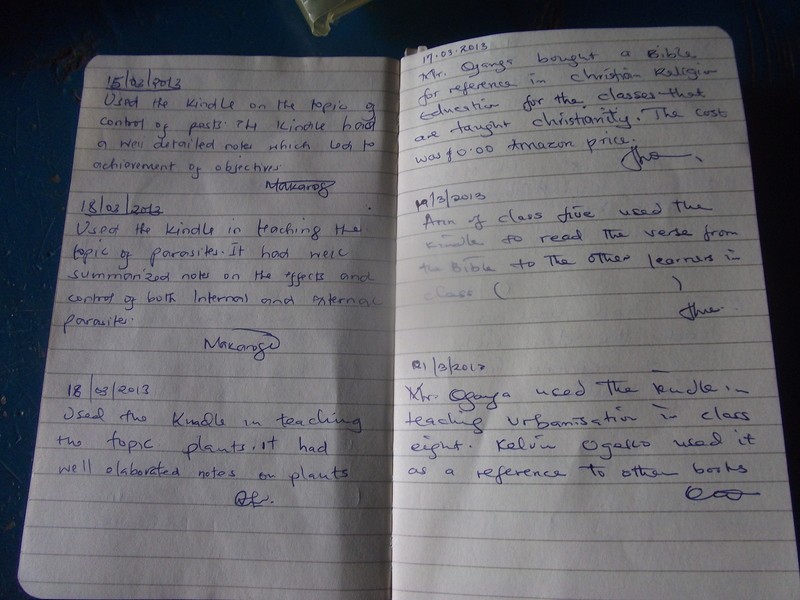 Connectivity: as mentioned the Kindle Keyboards include 3G, so the teachers can connect directly to the Amazon store, and search Google and Wikipedia without needing Wi-Fi. 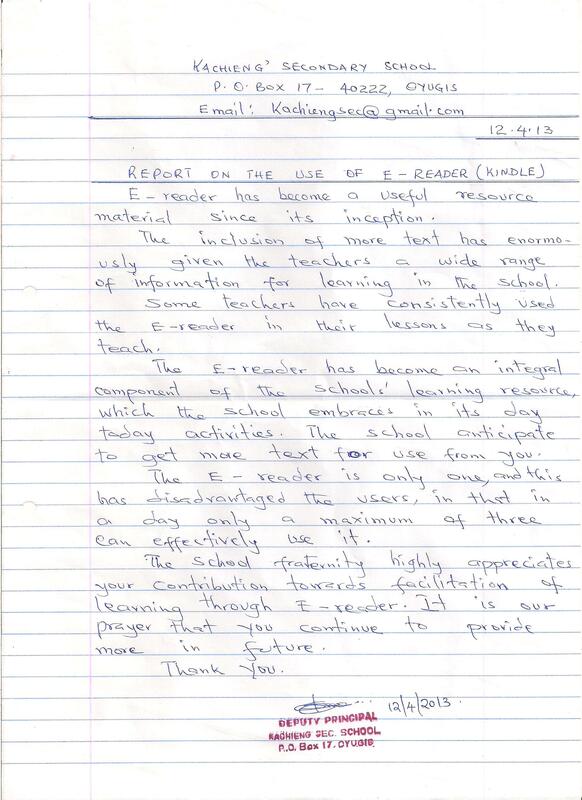 As the schools don’t have Wi-Fi 3G connectivity provides virtually immediate access to materials for the teachers, even while teaching, etc. However, we also want to evaluate Wi-Fi, and ways to establish rural Wi-Fi for the schools, and the lowest priced Kindle, the Kindle 4, only comes in a Wi-Fi model. So we need to find ways to support these devices in the field as supplies of the older Kindle Keyboard dry up. We will cover connectivity in more detail in another blog post. Content distribution: We are using both ‘push’ and ‘pull’ methods of content distribution. Pull is where the user (a teacher in this case) downloads the content to their eReader. Push is where content is sent to devices. Materials are also copied onto the devices directly from a computer using a USB connection. Services including dropbox are excellent to transfer and share materials over the Internet easily and effectively. Materials: Many of the books in Swahili are published via Longhorn Publishers and available from Amazon. However there are other publishers of potentially suitable eBooks who don’t support the Amazon formats, instead they publish books in the ePub format. We are in discussion with various publishers in Kenya, and the UK, to find useful and relevant materials for the teachers; together with ways to make the material ‘work’ on Kindles, other eReaders, and Tablet devices. 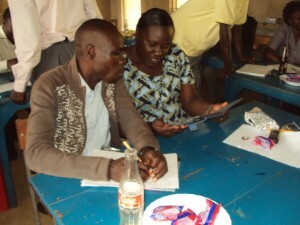 We are also evaluating Android Tablets and other eReader devices during the pilot period. Welcome to the Kusaidia Mwalimu web site which is where you can learn about our project to help teachers in Kenya, and beyond, to teach more effectively and with a wider range of material than they typically have available. The name of the site is Swahili for supporting teachers, as that’s the primary aim at this stage of the project.